Writing about my last-minute wedding gift yesterday got me thinking about some of the projects we made for our own wedding. I really wanted our bridal party to have special, but functional gifts. The groomsmen were pretty easy: cufflinks, ties, and crystal decanters and DOF glasses. The bridesmaids, on the other hand, were a little more difficult to buy for. When my husband and I were planning the wedding, I was very opposed to spending money on useless keepsake junk (does anyone really need a paperweight with someone else's name and anniversary on it? Really?). So, I bought each of the girls (a pretty heavy drinking lot, by the way) a set of colored, polka-dotted wine glasses, but needed something to go with. A fortuitous trip to the Shipshewana, Indiana fleamarket gave me an idea. There are numerous booths at the fleamarket that sell very inexpensive (but good quality) nail clippers, tweezers, nail files, etc. I purchased one of everything for each bridesmaid (and myself of course!) and decided to make manicure/pedicure kits. I bought super discounted $1/yd. fabric, binding tape, grosgrain ribbon, and clear vinyl (which is surprisingly inexpensive at fabric/craft stores). 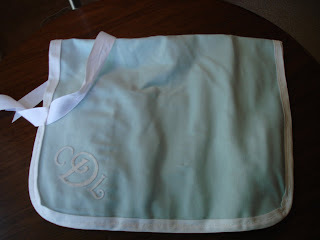 I also purchased iron on letters to put monograms on the completed kits. I basically started by laying out all of the items I had bought with the correct spacing between them. I determined the size of fabric I would need to cut, taking into account the space I would lose to stitching. I opted for a rectangle that would have manicure tools on each end, then would fold in half and roll up (see pictures: the crease in the center is where the rectangle would be folded in half, then rolled up from bottom edge in photo to top). I cut the fabric first (which was a rather thick, home decor canvas), then cut plain white muslin as a liner; the size of mine is about 12" x 20". Using the size and height of the various tools, I decided what size to cut the vinyl (about 12" x 6"). This made my pockets just under 6" deep. I stitched binding tape along the top edge of each piece of vinyl. Then I pinned the vinyl to the lining fabric and stitched perpendicular to the edge at regular widths (wide enough to accommodate my tools, there is stitching between each item under the vinyl). Then I pinned the fabric, lining and vinyl together and stitched binding tape around the entire perimeter of the rectangle, making sure to stitch through all of the layers. The binding tape covers the raw edge and binds (hence the name) all three layers together. When I was finished binding the outside of the rectangle, I cut a length of ribbon, folded it in half, and stitched the fold under the binding tape edging about 1/4 of the way up the side of the rectangle. When the parcel is folded in half, this ribbon will be halfway up the edge. When the bundle is rolled up, from the plain edge toward the ribbon edge (as shown in the picture, the right edge would be rolled under all the way to the left edge), the ribbon will wrap around the outside of the roll to hold it together when tied in a bow. 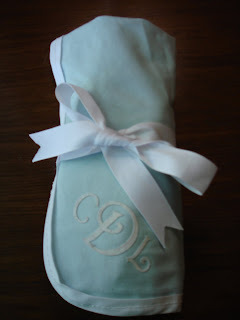 I finished the bundle by ironing on the monograms and filling the pockets with the goodies. These instructions may be unclear, but the pictures should help. 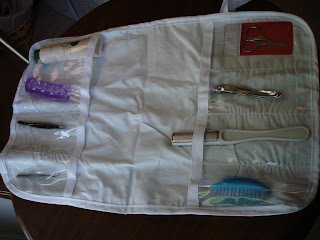 This project is just a jumping off point; it can easily be adapted to other tasks (just in case you don't need a mani/pedi kit). Seed packets, gloves, a ruler, marker, shears, twist ties for attaching plants to stakes for a gardener, maybe with a cute garden print fabric. One end with long, narrow pockets for knitting needles or crochet hooks and maybe two rows of vinyl pockets on the opposing side to hold stitch markers, measuring tape, cable needle, small scissors, etc. Sewing notions? Screwdriver or wrench sets? Hotwheels for race night sleepovers? Be creative and enjoy!